So, you still haven’t decided where you want to take Mom for Mother’s Day? On the menu: Prime rib, Tuscan-style chicken and gnocchi, Sangiovese braised beef short ribs, toasted orzo Greek salad, cheese blintzes, house-made tiramisu, warm banana bread pudding. Full menu available here. Time: Noon to 5 p.m., with live music from noon to 4 p.m.
On the menu: Belgian waffle and omelette bar, white port poached chicken breast with pistachio cream, prime rib, spiral-sliced ham, Alaskan halibut en crote, cheesecakes and lemon meringue and Key lime pies. There’s an easy way you can help the hungry on Saturday (May 8), and you don’t have to go far to do so…just out to your mailbox. This Saturday is the National Association of Letter Carriers’ annual Stamp Out Hunger food drive. It’s simple: Just gather up some non-perishable food items (canned meats, fish, soup, juice and vegetables, and pasta, cereal and rice are all good — no expired items or anything in glass containers, though), put them in a bag and leave them at your mailbox early on Saturday (before your letter carrier usually visits). Your carrier will pick up the food and it will be distributed to a local food bank or pantry. The drive is being co-sponsored by Feeding America, which operates in Riverside as the Second Harvest Food Bank, so you know your donations will be distributed right here in the Inland Empire. OK, we’ve mentioned this site before, but it has grown, and the discounts have gotten steeper. SoCal Gift Cards (part of the Los Angeles Newspaper Group, as is Dine 909) now has at least 50% discount on all their offerings. Last time we wrote about them the discount was 25%. Currently participating restaurants include Caf Calato (Rancho Cucamonga), Salsitas Mexican Grill (Rancho Cucamonga), Canton Bistro (Redlands), Kool Kactus Caf (Loma Linda), Joe’s Sushi (Riverside), Napoli Italian Restaurant (Loma Linda), Taco Village (Redlands), Phood on Main (Riverside), Crescent Jewell Restaurant (Riverside), Ruby Tuesday (Temecula), Monark Asian Bistro (Riverside), Mill Creek Cattle Co. (Mentone/Redlands) and Zorro’s Mexican Restaurant (Redlands), to name about half of the restaurants. It’s a great way to check out those restaurants you’ve been wanting to try without taking too much of a risk. They have other discounts, as well, including salons and day spas, amusement parks, a florist and a University of Redlands concert. Feel free to swing by their website and check ’em out. Wanna show it off and help feed the hungry in the process? 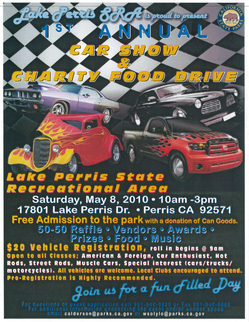 Then come down to the inaugural car show and charity food drive from 10 a.m. to 3 p.m. Saturday (May 8) in lots 9 and 10 of the Lake Perris State Recreational Area, 17801 Lake Perris Drive, Perris. If you are interested in participating, roll-in begins at 9 a.m. and is open to all classes: American and foreign; car enthusiast; hot rods; street rods; muscle cars; and special interest (car/truck /motorcycles). All vehicles are welcome. Prizes will be awarded to winners in the car show. For more information, registration, and updates please call 951-940-5600. In this post from her RC Now blog, Rancho Cucamonga reporter (and Dine 909 contributor) Wendy Leung notes that fondue restaurant The Melting Pot has closed. Dine 909 had the occasion to visit the Melting Pot once. We had a late reservation (9 p.m., I think) and we weren’t seated until at least 30 minutes after that. Then, we were rushed through our meal. The server seemed like he couldn’t be bothered. We thought they were overpriced and in a poor location. No. We’re not surprised they closed. If you missed out on the fondue experience at the Melting Pot, you might want to give Hip Kitty Jazz and Fondue in Claremont a try. Judging by their all-inclusive meal for two, it seems just as pricey, but it looks as though you get more for your money. And as a bonus, you get live entertainment with your meal. 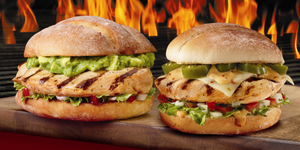 Beginning today, your local El Pollo Loco will be serving up two new grilled chicken sandwiches. Each sandwich is made with a marinated chicken breast atop a grilled telera roll. Shredded lettuce and pico de gallo are added. The guacamole chicken sandwich (on the left) also includes, um, guacamole, while the jalapeo chicken sandwich (on the right) gets sliced jalapeos, Pepper Jack cheese and a spicy Southwestern sauce. I’m usually a Pollo Bowl kind of person when I head over to El Pollo Loco, but I’ll likely give these sandwiches a try. If you give ’em a try before we do, let us know in the comments below.